The Viking 52 SC follows the path of our relentless R & D development program to build models within models to enhance the Viking line up from 42 to 92 feet by offering exciting and new variations of our latest designs. The hull and running surface of the new 52 Convertible is the perfect platform for the 52 SC. With 12-degree transom deadrise, and molded strakes for lift and planning efficacy, the resin infused hull features a matrix of Aramid and E-glass hybrid knitted fiberglass laminates, foam and end-grain balsa coring, custom blended modified epoxy and polyester resins, and vacuum-bagged composite bulkheads throughout. 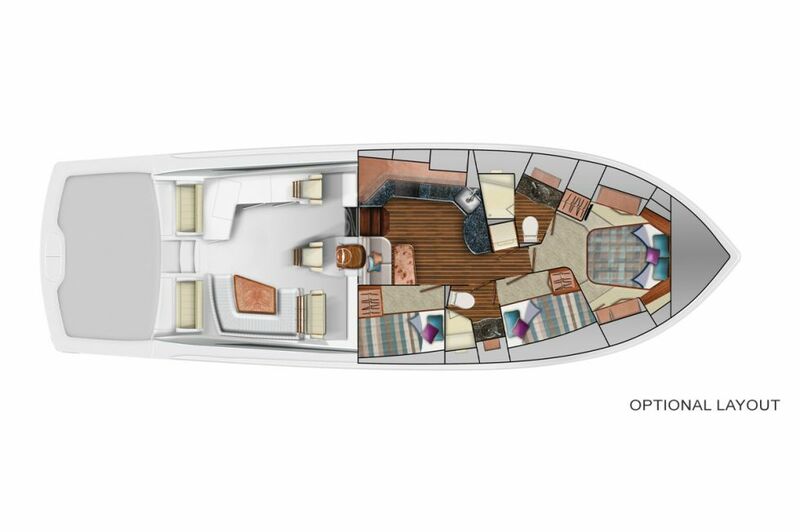 We cordially invite you to contact your Viking dealer regarding the availability of the 52 SC and 52 Open. Our computer-operated five-axis profiling milling machine carved a new plug to make a stylish deck assembly mold, which includes a climate controlled three-sided fiberglass deckhouse with a raised command bridge helm station for outstanding visibility. The bridge area includes three Stidd helm seats, a U-shape lounge and a molded fiberglass console with capacious stowage, a refrigerator and pop-up flat screen television. At the helm, DC power-assisted hydraulic steering matched to high-speed stainless-steel rudders provide fingertip response, while the single-lever electronic controls harness the horsepower from the twin MAN 8V 1200 CRM 1,200 mhp second generation common rail diesels. Cruise speed will be in the mid-30 knot range with the top end around 40 knots depending upon load, sea and environmental conditions. Accommodations below are surprisingly generous thanks to the boat’s 17 ft. 6 in. beam providing a master stateroom forward with a walk around queen-size bed, along with a private head and shower. Two additional staterooms are served by the second head. A combination salon and galley complete the interior plan with comfort and room to spare. The 142 square-foot cockpit boasts twin mezzanine seating with built-in freezer and stowage space, engine room access, a step box cooler, tackle stowage, recessed in-deck fish boxes and a walk-through transom door with lift gate. Palm Beach Towers, a subsidiary of Viking, which specializes in aluminum and fiberglass fabrications, will outfit the first 52 SC with a custom designed tuna tower to demonstrate the new model’s affinity for blue water fishing, as well as negotiating the shallow waters and flats encountered throughout the Bahamas, thus creating another highly defined model with exceptional versatility in the Viking tradition. 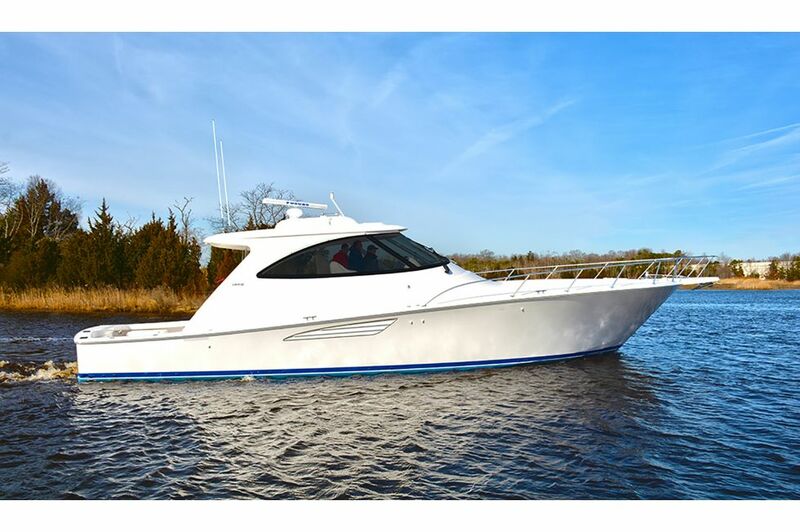 Viking’s subsidiary, Atlantic Marine Electronics will equip the 52 SC with custom navigation, communication and entertainment systems allowing for turnkey delivery. The Viking 52 SC two additional siblings, the Viking 52 SC (Sport Coupe) featuring the eye appealing profile of the 52 SC with its three-sided fiberglass deckhouse, but to accommodate the needs of cruising yachtsmen, a customized fiberglass arch for radar and other antennas or a fiberglass mast will be available. Dramatic paint schemes to compliment the roof line, radar arch and mast also will be offered for added personalization. Finally, a third version is the Viking 52 Open with its custom made signature fiberglass wraparound windshield so popular aboard our hot ticket 42 Open. 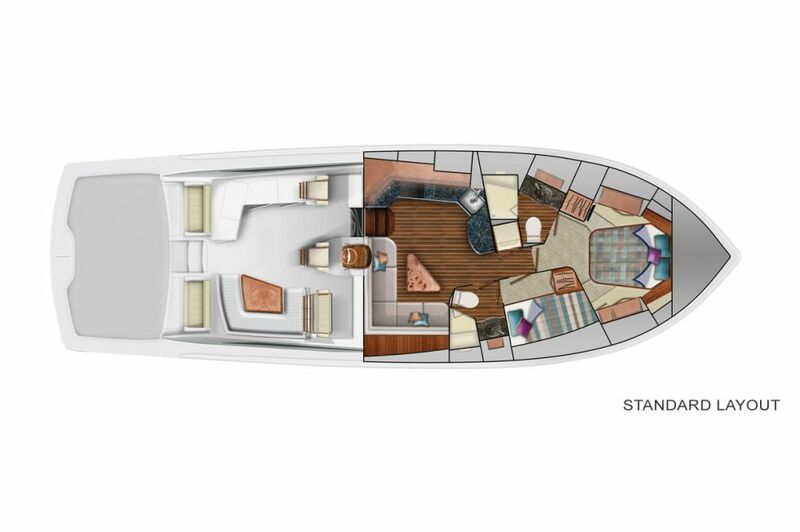 Like the Viking 52 SC, the 52 SC and the 52 Open showcase the same inviting three-stateroom two-head layout affording ideal cruising and entertaining accommodations, as well as the bi-level 142 square foot cockpit with its observation mezzanine.